love, fresh air and sunshine: Natural Learning FAQ: "How does your daughter learn Math at home?" Natural Learning FAQ: "How does your daughter learn Math at home?" A brilliant mind and an articulate voice for the new age, Joseph Chilton Pearce (Joe), passed on a few weeks ago (Aug 23rd) at the age of 90. I came to know about Joe through a friend about three years ago. I was fascinated by his writings which were about play, learning, child development, evolution of consciousness, modernity, spirituality all rolled into one. On Sep 26th this year was Periyasaami Thooran's 108th birth anniversary. 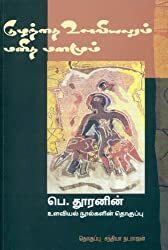 I came to know about Thooran about the same time too, and his writings about children were very radical and probably the only ones in Tamil from his times. The writings of both these giants were based on observations of children and their processes of learning, backed by serious scientific research. They were far ahead of their times. I dedicate this little piece of writing to Joseph Pearce and Thooran, both of whom have been in my mind a lot over the past few weeks. People often ask me “So, if Isha does not go to school, how does she learn Math?” Though in one sense, it's a perfectly understandable and valid question to ask, I personally find it rather strange! That people actually think we learnt all the math that we use as adults in our classrooms!! I personally didn't. Here's some scientific explanation to prove it, very much inspired by Joe's writings. Our brain typically has a hundred billion neurons (brain cells) all connected together. Every connection has a tiny gap called 'synapses'. For us to learn something new, an electrical signal needs to jump across this gap to continue its journey. Learning is all about creating and strengthening pathways through these neurons. The more 'neural pathways' get created, the more complex our understanding becomes. These pathways are supposed to get stronger through repetition. And the stronger they get, the better we become at what we have learnt. Watch this beautiful three-minute video explaining this. Research also says that we retain the least of what we see, or read, or hear, but the most of what we experience. Putting the two together confirms what I have independently arrived at: When it comes to learning, nothing can replace REAL EXPERIENCE involving all our senses - smell, taste, touch, sound, sight and emotions. And guess what activities are so alive for children, that all their senses are the most heightened, and help form super strong neural pathways? Real work where they feel like they are engaged in something meaningful and purposeful. Play of different kinds. For infants, it is literal IMITATION of what they see around them. For kids slightly older, it is PRETEND PLAY / IMAGINATION. For older kids, it is GAMES WITH RULES which get more and more complex as they grow. A few instances from our lives where Isha learns Math concepts, without being told or being aware that she is “learning” something, or that it is “mathematics” or a “concept”. She just gets absolutely engrossed in what she does and is completely in the moment. Learning simply happens as a by-product of that experience. * Idli plates always make idlis in multiples of four. “Amma, let me pour the batter” the little one would come running when she was barely three years old. I'd ask her to find out from everyone at home how many idlis they'd like to have. She'd come back with the numbers. And off we'd go “five for x, three for y, four for z” pouring the batter. Watching five, three and four come together in 'fours'. “There goes an extra one on the second plate for x, and so on. Spilling some batter on the floor. Smearing it and making what some people would call “a mess” was all part of the experience, literally helping her soak it all in! * Isha and her friend A (another homeschooling child in Chennai) spent a whole day making packets of dry groceries in reStore. As I watched them from a distance, they had a serious discussion about why salt that they had just finished packing needed smaller covers and the roasted gram needed bigger ones for the same half kg. After a few speculations, they arrived at an explanation that was very close to the one about densities and volume being indirectly proportionate. I have a feeling that with the smell of the roasted gram (which they occasionally popped into their mouths) and the experience of running their fingers through it formed a new neural pathway. You know how sometimes when we think of a concept, or a name, or something abstract like that, it always comes accompanied with the memory of a smell, taste or an emotion? * "Five rows of four labels here. That makes it 20 labels!" They were discussing as they were engrossed in sorting out and cleaning the labels at reStore. * “Amma, why are there those stick figures instead of numbers?” she asked a few days ago pointing at the roman numerals on our wall-clock. I told her they are numbers too written in a different way. She said “Aah! 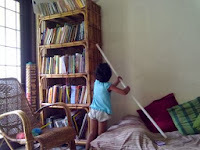 Wait a minute” and ran inside and brought a think booklet on Tamil alphabets which her grandmother had once gifted her. She had remembered seeing a whole page of these same stick figures. She asked “Isn't this the same?” I nodded yes. And she spent the next 2-3 minutes looking intently at the roman numbers all the way up to 3,000 (MMM). Less than five minutes is all it took for an initial registering of all the letters that made the roman numerals upto 1,000! And she said "Now, you tell me a number and I will guess its letters" and tested herself to make sure she got it ok.
* Floor tiles are an excellent way to experience how numbers come together in different ways. I've written about it in my blogpost Amma, what is 2+2+2+2+2? * Spontaneous discoveries and explorations using simple open-toys, materials that are not originally meant to be toys or even if they are, can be interpreted and used in infinite ways. I've written about another exploration of hers where she experimented for a whole half hour with different gradients and how fast the earrings came down when she lowered or raised the tube. * On a typical day, she gets to play at least one game using the dice. Snake and ladder, ludo and many more. Beginning by counting the dots on the dice, she can now see them and tell the number. And the fascinating different permutations and combinations of numbers and how they add up: 4+5 is 9, and so is 6+3! As we use the dice over and over again, these simple truths about numbers and how they add up become so obvious! Just like how young boys in the olden-day grocery stores used to do their mental math so effortlessly before the age of supermarkets and billing machines. 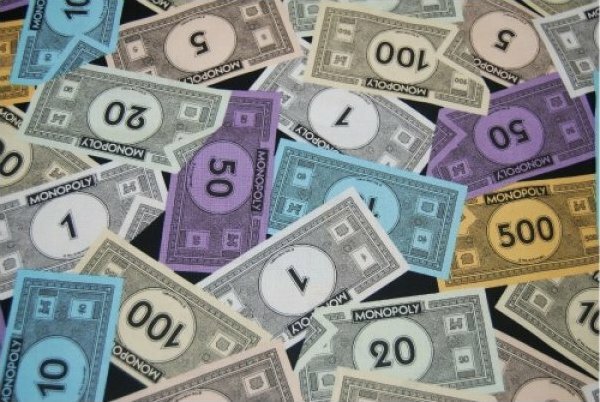 * Monopoly does not quite go with our worldview, and I resisted getting it for quite a long time. Upon Isha's insistence, I got over my hang-up and got one. (Our experiences with this game is for another post.) It's one of her favourite board games and we sometimes round off our rent-paying to the nearest '5' or '10' so that we do away with the 1- and 5-rupee notes. Some other times, we use the 1-rupee and calculate our rents and pay them more accurately. By the way, we've been working on a 'Gift Economy' board game as well. Hope to have it ready soon! * "Does this shape actually have a name?" Isha asked pointing at a trapezium, while making a bright and beautiful pattern. A lot of learning about shapes, how they fit or don't fit with one another happens with this activity, which we do because it's engaging and pleasant. Once we ran out of red diamonds before completing a round of it, and Isha spontaneously picked up two red triangles and placed them together "See, now we have a diamond!" And no, we don't talk about 'learning' or 'math' or 'geometry' here. * Her 7th year birthday gift from us was 'Zoni', a currency we came up with to use in all our shop-keeper games, one of her most favourite games that she could play all day everyday until recently. She almost does not play them anymore. * Many times we're experimenting creating our own board games, and she does the numbering within the squares. Pinterest has plenty of ideas for DIY boardgames. * I've played 5-stones (anju-kal) with ten-year old girls in Marudam school. While the game I've played when I was young used to be as simple as 'when you finish one round, you get one point', theirs was quite complex. It involved a lot of borrowing and passing on between the players, that my mind simply could not keep track of. “Here I give you 14. That makes it 45 for you. You owe her 3, and that'd bring it down to 42.” That sort of a thing for every player to remember. I simply gave up. But the 10-year olds were adding up and subtracting effortlessly! * As we were circumambulating the Chidambaram Temple, she stopped at the large wall painting of the Wheel of 'The Universe and its Vegetation'. It had the Tamil months, Sun signs (rasis), Star signs, and the corresponding auspicious trees all in relationship with each other. She stood there asking me to read every single thing written on the board for at least half an hour. To most of her questions, my answer was "I don't know. Let's find out." Even though it had gotten dark, Isha insisted that I take a photo of it so we can go home and learn all about it. * Isha has been playing the keyboard and self-teaching some songs like 'Do-a-deer...', with occasional help from me to locate the exact notes. After a whole year of practising and perfecting that one song, she's now on to her second song 'Let it go'. And piano keys are so mathematical themselves: the seven notes repeating themselves in every octave, the half notes, the harmonies, etc. are another world in and of themselves to explore. * “Shall we make a garland with these sangupushpam flowers, with these pink arali flowers as the pendant? But wait a minute! Before we begin, let me count them to see if we have equal numbers for both sides. If they're not, then I'd have to go get one more to make them equal.” and off she started placing '1' on the left side, '1' on the right side, '2' on the left, '2' on the right and so on. Will these bright colours and fresh smell and the soft texture become part of her learning about even and odd numbers? And these are a tiny percentage of all the different explorations that happen, where what we adults call "math learning" happens. I could write similar posts on "science learning", "geography learning", "history learning", "language learning" and so on, for the benefit of those interested in "academics". And no, we don't ever sit down because she needs to learn any of these. If observing a single child's learning can be so fascinating, I wonder how rich a children's space for self-designed learning could be with a hundred different things to observe, understand, record and share! There's more to share. Another day! Have you watched this movie "Captain Fantastic"..
Can so relate to this. Thank you Sangeetha for putting them together so well.